Nelsan Ellis, as Lafayette seems to be a bit upset about what’s going down in Bon Temps, LA this season according to the Star-Telegram. In the Season 5 premiere of True Blood, Lafayette Reynolds declares that he’s fed up with all the supernatural shenanigans that go down in Bon Temps, La. He’s sick of living among vampires, werewolves, ghosts, witches and maenads. But does he pack up and move? No way. 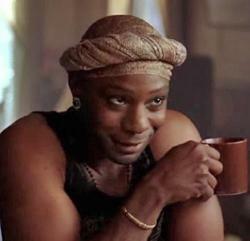 Lafayette, a fan favorite played by Nelsan Ellis, isn’t going anywhere. “It’s going to be a busy season for Lafayette,” Ellis says. He has barely had time to deal with the death of his brujo (male witch) lover — and now, in the return episode, at 8 p.m. Sunday on HBO, Lafayette and Sookie (Anna Paquin) have a new mess on their hands: Their beloved Tara (Rutina Wesley) has been shot and killed. Their response to the situation might surprise you. In this five question interview, Nelsan Ellis answers some questions about his character of Lafayette. Given that your character was going to be killed off at the end of the first season, you obviously know a thing or two about hanging on for dear life. Yeah, Lafayette was supposed to die. But [creator/executive producer] Alan Ball decided to keep me. And it blows my mind, the things I’ve gotten to do since. Based on what I was doing in the first season [in which Lafayette was introduced as a short-order cook, a drug dealer and a prostitute], I put my mind on one track. Then they completely busted all the boundaries and took the character places I never thought he’d go. That’s why I love this show. You never know what’s coming next. Why do you think vampires and supernatural beings are popular today on TV, in movies and in books? During this particular time, with the bad economy and the hard times people are going through, I think that the supernatural world is an escape. People need a break from everyday life. Which is the bigger acting challenge on this show: remembering your lines or cleaning off fake blood once the scenes are over? The special-effects stuff is the hardest. The fake blood can tear your skin, it’s so sticky. If you’re doing a scene where you’re suspended in a harness, your family jewels are getting all torn up. And imagine trying to talk with fake vampire teeth in your mouth. Of course, I haven’t had to do that yet, thank goodness. What do you most hope people get out of watching? When you’re not working on True Blood, what are you working on? I am executive-producing a documentary about the spike in suicides among young LGBTQ individuals. It explores suicide and bullying, and we follow six young LGBTQ individuals who happen to be poets. They basically tell the world how they found a reason to love themselves despite what everybody around them is saying. Hopefully other young people see this and listen to their stories and decide that they don’t have to wait for everything to get better one day, that they can actually control their circumstances themselves.